The CleanFinancial.com guide to spread betting on Alibaba shares. Where to Practice Trading Alibaba Shares? How to Spread Bet on Alibaba? This market may be available with other firms. Note that we also have a live Alibaba chart. This market may be available with other firms. Where Can I Find Live Prices and Charts for Alibaba? The interactive chart below offers a good view of the Alibaba market. The Plus500 chart above usually shows the underlying Alibaba futures market (not the spot price). If you'd like to look at real time spread betting prices/charts for Alibaba, you might need a financial spread betting account. Of course, if you do decide to trade, please remember that financial spread trading and contracts for difference do involve a high degree of risk to your funds and it is possible to incur losses that exceed your initial deposit. For more details, see Advanced Alibaba Trading Charts below. The US stock is above the 20 day MA of $175.76 and above the 50 day MA of $168.30. Price data from Google Finance. Also see Live BABA Share Price & Charts and About Alibaba for more information. With the tech firm trading at a much higher multiple of expected sales than its peers, IG talk to Cyrus Mewawalla, MD at CM Research, about whether shareholders have been given the full picture about the risks involved. The company's management is looking to grow in the long term, with mobile payments a key potential market and Paypal an acquisition target. Can Alibaba Impress with its First Results Since the IPO? Ahead of the online retailer's first set of results since floatation, IG talks to RJ Hottovy from Morningstar about what the figures may include. Particular interest will be paid to expansion plans and the prospect of an online payment tie-up with Apple. Looking at the early pricing Financial Spreads, IG, Capital Spreads and City Index all have 8¢ - 9¢ spreads. CMC are running a 13¢ spread and ETX have a 16.5¢. At the moment then, you'd probably trade with one of the firms offering 8¢ - 9¢ spreads. Having said that, keep your eye on the spreads, it's unlikely to stay this clear cut. I'd expect CMC and ETX to fall in line with the other firms sooner rather than later. Also, it's easy to see some of the other firms with tighter pricing actually widening their spreads if the market gets nice and volatile. We've now added a live chart for BABA, see Live Alibaba chart. We covered many of the grey market moves in the lead up to the IPO. For more details on how the IPO panned out, please see the Story of the Alibaba IPO. Now the shares have listed on the NYSE, spread betting and CFD markets based on the share price are also live and currently trading at $93.38 - $93.49 with Financial Spreads and InterTrader. The pricing is much tighter compared to the IPO markets, e.g. some firms are offering it with a $0.09 spread, i.e. 0.10% spread (or 0.05% either side of the underlying market). With the IPO market, there was normally a 10pt spread, i.e. ie a spread of $10bn or 5%. You can buy the market but you can't short sell it just yet. Spread betting companies have problems laying off short positions on American shares and therefore normally wait for the market to calm down before taking on short positions from clients. It might be another month before you can short the stock. Of course, if you already have an open 'buy trade' on Alibaba then you will be able to close (sell) your trade. A host of different intervals such as 5 minutes, 30 minutes, 1 day etc. Helpful chart overlays such as Parabolic SAR, Ichimoku Kinko Hyo, Price Channels etc. A choice of indicator charts such as Relative Strength Index (RSI), Standard Deviation, Qstick etc. 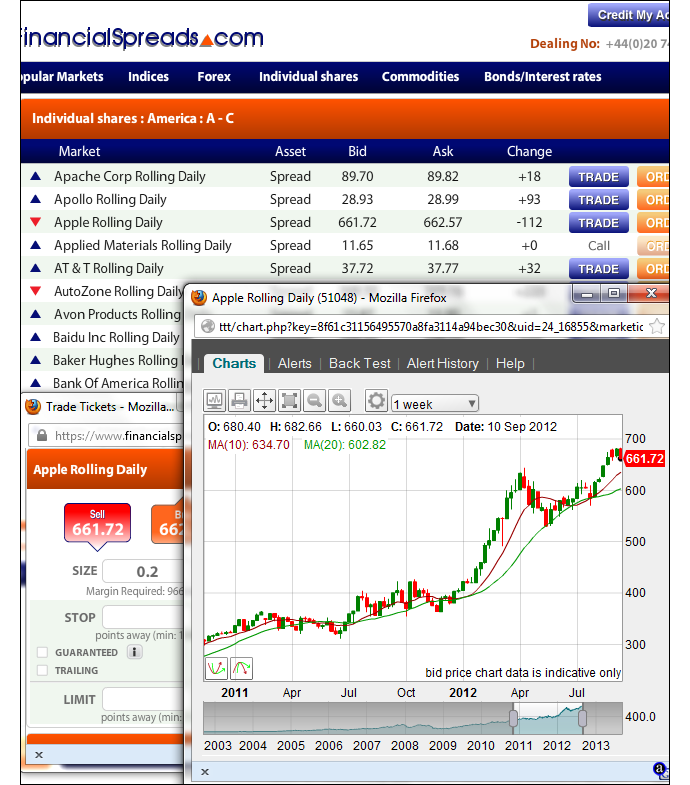 Advert: Alibaba Spread Betting and CFD Trading Guide, sponsored by FinancialSpreads.com. You can spread bet on Alibaba with Financial Spreads. Where Can I Spread Bet on Alibaba for Free? Trading isn't risk free, however, if you would like to open a (free) Practice Account, which lets you trial spread trading, please see below for further details. When looking at which trading option is right for you, also remember that in the UK, financial spread betting is tax free*, i.e. it is exempt from stamp duty, income tax and capital gains tax. Each of these firms currently provide a free Practice Account which investors can use to practice with trading orders, try out new theories and analyse professional level charts. If you want to speculate on Alibaba then one solution is to spread bet on the share price. With spread betting on US shares you trade in £x per cent. So, if you decided to have a stake of £3 per cent and the Alibaba shares move $0.25 then that would alter your profits (or losses) by £75. £3 per cent x $0.25 = £75. You can also trade this market in Euros or Dollars, e.g. €x per cent. Note that this is a Rolling Daily Market and therefore unlike a futures market, there is no closing date. Therefore, if you decide not to close your trade by the end of the day, it will simply roll over to the next session. For a more detailed breakdown of Rolling Daily Markets please read our article Rolling Daily Spread Betting. Then you may decide that you want to buy at $93.48 and risk, for the sake of argument, £3 per cent. With such a bet you win £3 for every cent that the Alibaba shares increase and move above $93.48. Nevertheless, such a bet also means that you will make a loss of £3 for every cent that the Alibaba market falls lower than $93.48. Looked at another way, if you were to buy a spread bet then your P&L is found by taking the difference between the final price of the market and the initial price you bought the market at. You then multiply that price difference by the stake. Trading shares, whether by spread trading or otherwise, is never simple. In this case, you wanted the share price to rise. Naturally, the share price could decrease. If the tech shares fell then you might choose to close your position to stop any further losses. Note: Alibaba Rolling Daily equities market taken as of 19-Sep-14. Here we take a look at the lead up to Alibaba's listing on the New York stock exchange. We certainly had an interesting first day of trading. The stock was initially offered at $68 but as it hit the stock market all the automatic trading orders kicked in and the market immediately spiked to $92.70. The stock eventually closed at $93.89. According to the New York Times, that put the firm's market capitalisation, at the end of the first day of trading, at $231bn. For anyone trading the grey market, that meant the market would be settled at 231 - good news for almost anyone buying the market. This is the last of our IPO posts, please see for updates on trading the Alibaba stock. 19-Sep-14 [4:00pm] The IPO is Finally Here! At $68 per share, they are raising $21.8bn and that values the firm at $167.6bn. The valuation is below what many believe to be Alibaba's true value of around $200bn (or more on some spread betting sites). Trading in Alibaba should start within the first couple of hours of the NYSE open. Alibaba at $87-89 per share! In the latest news, Alibaba was looking like opening significantly above its IPO price, somewhere around $87-89 per share. If so, this could likely trigger underwriters to use an option to sell more shares and put the value of the listing around $25bn, the largest ever. There is some risk that Alibaba's IPO could cause some liquidation of other US stocks as investors aim to free up some money. It's not long before the Alibaba (ticker BABA) stock opens for 'trading proper' on the NYSE. The IPO grey market is trading just a touch down from yesterday at 219 - 229, and suggesting the BABA market cap will close today around $219 - $229bn. You can still take a position on this market although note that the spread betting and CFD markets on Alibaba share price should be up and running by around 2.30 / 3pm UK time. Also, note that the spread on those markets will be a lot tighter than then IPO market. 18-Sep-14 [7:02pm] There She Goes! The Alibaba IPO market is now trading up at 225 - 235. With a midpoint of 230, that suggests that investors think that, by the end of play on Friday, Alibaba will have a market cap of $230bn. That's the highest valuation I've seen. (Price on Financial Spreads and Capital Spreads). There's an interesting article on Bloomberg which looks at how 4 of the last 5 largest listings on US stock markets fell more than 17% in their first year of going public. Read, 'Beware Past Mega-IPOs Tumbling'. The Financial Spreads and InterTrader Alibaba IPO markets are now trading up at 210 to 220, i.e. suggesting a market cap of $215bn when the shares, which IPO tomorrow, close. If you look at the chart, the market has been swinging a lot this week, trading as high as 225 ($bn) and as low as 204 ($bn). At least I'm not the only one who hasn't got a clue how to value the firm. With the largest IPO ever attempted and a proven business model, Alibaba may be an interesting proposition for investors. In this quick video, IG talks to Justin Urquhart Stewart from Seven Investment Managament about the challanges the Chinese company faces in building confidence. Over the weekend we reported that Alibaba Group Holding will probably IPO around the $162bn mark (see below). That was well below Friday's grey market forecast of $221bn, however the grey market has cooled off, it is now back at 205 ($205bn). Of course, if China's largest ecommerce firm does IPO at around $162bn and the grey market has only dropped to 205 ($205bn), then that means traders are expecting a very healthy first day of trading. It's not difficult to foresee significant interest in the shares but it might take more than a genie to add $43bn to the market cap in one day. (The grey market closes at the end of the first day of trading). Alibaba Group Holding has said its shares will probably IPO at around $60-$66. Although we're getting closer to the firm being listed, we're not there yet. The company kicks off an international investor roadshow this week. They aim to announce the final price on 18 Sept and the company should go public on 19 Sept. The group plans to sell $24.3bn worth of shares (Facebook raised $16bn). According to Bloomberg such a valuation would give it a market capitalisation of $162bn. While $162bn is certainly a lot lower than some of the valuations we have seen this week, it would still make it the third most valuable internet firm after Google ($395bn) and Facebook ($197bn). Nevertheless, investors trading the Alibaba IPO financial spread betting market should remember that the market is settled at the end of the first day of trading on the stock exchange. With companies (and the advising banks) liking well received initial public offerings, it's not difficult to imagine the share price being set fairly low. And therefore we could see a solid jump on first day of trading. That certainly happened with the Royal Mail and Twitter IPOs (but not with the somewhat bungled Facebook IPO). Looking at the 2013 reports we can see that Alibaba had sales of nearly $250bn across all of its sites. That's more than Amazon and eBay put together. The Amazon market cap is about $157bn and the eBay market cap is about $68bn. Combined, that's a market cap of $225bn. The Alibaba grey market is up 1pt ($1bn) on yesterday and trading at 216 - 226, i.e. suggesting a valuation of $221bn. That's pretty close to the combined value of the two American firms. For me the key upside comes from the fact that a lot of China still isn't online. At the moment it's still the wealthier middle classes that are contributing to the impressive sales figures. That suggests a lot of room to grow. (and I really like the large margins that Alibaba currently has, although no doubt these will come down in time). As commented on below, for me, this is all about corporate regulations, the complex ownership structure and ultimately how much the Chinese government wants to control Chinese ecommerce. The Chinese government is becoming increasingly liberal but we know that they are more than happy to lay down the law when it comes who does what, where and when on the internet. This key negative will remain in place for a long time. I'm still pondering on this one. Like any investor...I don't want to miss out. However I'm struggling to measure the risk of the seemingly opaque corporate governance. 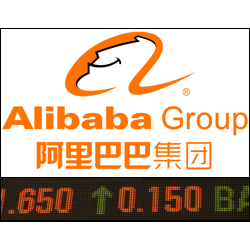 The Financial Spreads Alibaba IPO grey market opened on 7 April. Looking at the weekly chart, the valuation has certainly had a bit of a spike over the last week. Up until the end of August, the market had drifted around the $195-200bn area. This week the market has jumped 10% higher to $220bn. Where Can You Trade Alibaba Shares? If you're looking to speculate on the Alibaba share price then you'll have to wait until the stock is actually listed on the New York Stock Exchange. Once that's happened, provided there isn't a Facebook-style-IPO-nightmare, there's often a delay of 1-3 hours as the various price feeds pick up the new market. After that delay, I'd expect to be able spread bet / trade CFDs on the Alibaba share price with the usual suspects, i.e. the firms listed above. As with many markets, you can speculate on the upcoming Alibaba IPO. E.g. 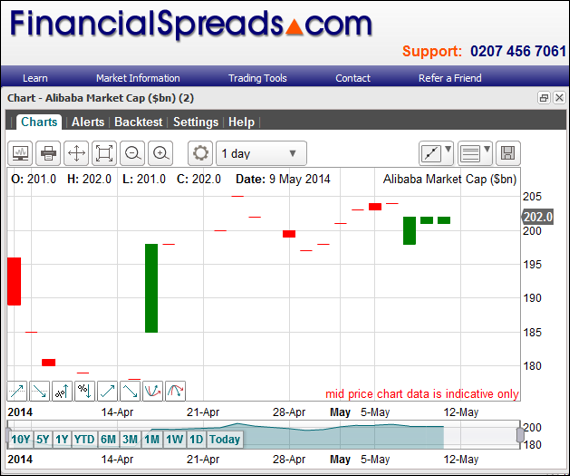 Financial Spreads are currently offering their Alibaba IPO grey market at 205.0 - 215.0. With this market each point represents $1bn Alibaba's market capitalisation at the end of its first day of trading on the New York Stock Exchange. At the end of its first day of trading. With this grey market you trade in £x per point. Therefore, if you decide to have a stake of £4 per point and the Alibaba market moves by 23 points ($23bn) then that would alter your profits (or losses) by £92. £4 per point x 23 points = £92. Then you may choose to buy at 215.0 for a stake of, let's say, £15 per point. With this spread bet you make a profit of £15 for every point that the Alibaba market closes higher than $215bn. Nevertheless, such a bet also means that you will make a loss of £15 for every point Alibaba closes lower than $215bn. Put another way, should you buy a spread bet then your profits (or losses) are found by taking the difference between the closing price of the market and the initial price you bought the spread at. You then multiply that price difference by your stake. Spread betting may not go to plan. In this example, you wanted the Alibaba IPO market to go up. Of course, it might go down. If the firm closed with a market cap of just $207.0bn, you would end up losing this spread bet. 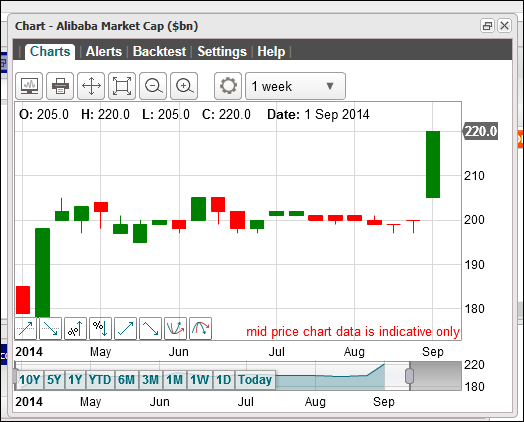 Note: Alibaba Market Cap grey market correct as of 03-Sep-14. Financial Spreads have been running their Alibaba market for over a month now and although it doesn't look heavily traded, looking at the chart below there is some support around the $200bn mark. The market is currently trading at 197 - 207, i.e. Financial Spreads estimate the firm will be worth $197bn - $207bn when the market closes on the day the firm IPOs. The Chinese internet retail giant has confirmed its intentions to float in the US. 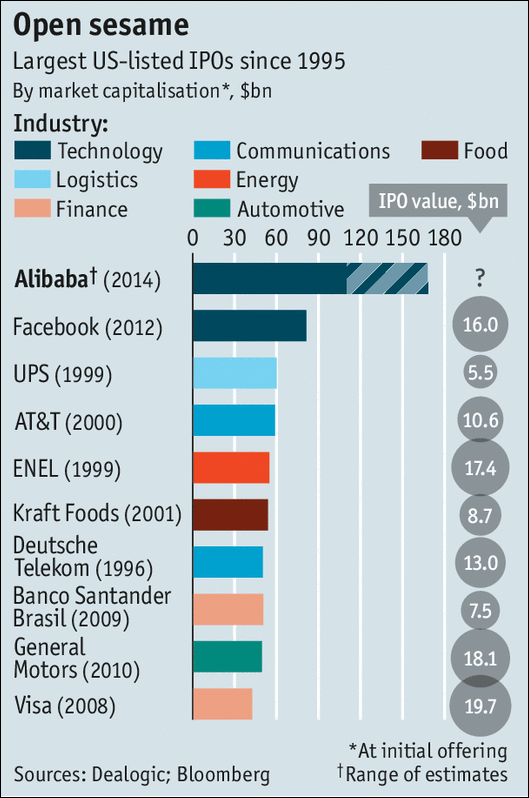 For more details The Economist has put out an interesting article, Alibaba's IPO, from bazaar to bonanza. (Other providers might also be offering a market). Also see the Wikipedia page for a basic overview of Alibaba group. How Do You Trade the Alibaba Grey Market? Financial Spreads are offering a fairly typical grey market which is based on the market capitalisation of Alibaba at the end of the first day of trading. The first day of trading, is the first day of unconditional trading, i.e. when Alibaba officially list on a stock exchange. At this point it's likely that it will be either the New York Stock Exchange or the NASDAQ but that has not been confirmed yet. The market is currently at 174 - 184 where each point represents $1bn. That means that Financial Spreads are estimating that the Alibaba market cap, at the end of the first day of trading, will be $174 - 184bn. And naturally that would make it one of the largest IPOs of all time. With the price at 174 - 184, if you think the Chinese internet giant will be higher than $184bn then you could buy at 184. Of course, if you think the tech markets are getting increasingly nervous and the stock will get a poor reception from investors then you can sell at 174, i.e. speculating that the market cap will close lower than $174bn on the first day of trading. At this point, the date has not been set so most firms are saying 'All open trades will be void if there is no floatation by 31 Dec 2014.' If in doubt, check with your provider. Twitter spread betting guide with live charts & prices, Twitter trading analysis, how to spread bet on the social network. Plus CFDs, where to trade... » read guide. Goldman Sachs spread betting and share trading guide with daily updates on the bank and a real-time GS stock chart & live prices. Where spread bet on Goldman Sachs commission-free and... » read guide. Morgan Stanley spread betting and share trading guide with daily updates on the bank and a real-time 'MS' stock chart & live prices. Where spread bet on Morgan Stanley commission-free and... » read guide. Nike spread betting and share trading guide with daily updates on the sportswear company and a real-time 'NKE' stock chart & live prices. Where spread bet on Nike commission-free and... » read guide. Starbucks spread betting and share trading guide with daily updates on the retailer and a real-time SBUX stock chart & live prices. Where spread bet on Starbucks commission-free and... » read guide. Salesforce spread betting and share trading guide with daily updates on the tech firm and a real-time CRM stock chart & live prices. Where spread bet on Salesforce commission-free and... » read guide. Lockheed Martin spread betting and share trading guide with daily updates on the manufacturer and a real-time LMT stock chart & live prices. Where spread bet on Lockheed Martin commission-free and... » read guide. JC Penney spread betting and share trading guide with daily updates on the retailer and a real-time 'JCP' stock chart & live prices. Where spread bet on JC Penney commission-free and... » read guide. Our Alibaba spread betting and CFD trading guide has live prices & charts. It also covers how and where to trade the BABA stock, regular commentary on Alibaba and... » read from top.